wow. that was impressive. i don't fancy myself much of a write and i am always blown away when i come across this kind of bloggy goodness!! Where is Buckwheat? Didn't he listen to his mom? Well, done! This is wonderful woven. I'm afraid for Buckwheat and his mom - is there a hawk in the vicinity? Ugh! Now that was good! You have a way with words! Well done! OK, you really shouldn't leave us in fear for Buckwheat's life ... its Friday, this is my Happy Day ... and you left me all distraught. This is wonderful-and I love that it is told from the point of view of an animal-fresh and clever! What a delightful story! This is told so well! Your word choice adds to the tone of the story well "whiff of apples" "loomed near". Love it! Well done! Great story :-) I think I said this last week, but I love these writing ideas. One of these days I will have to try it out. I really really really really enjoyed this story. I chuckled at the antics, ached for her loss, and my breath caught when she came back to the quiet and Buckwheat is gone. I also LOVE the names of your characters. I love how much Chia loved the sweetness of the raisins and that 20 was a huge bounty. I hope Buckwheat is just being rotten. Poor little buckwheat! Didn't he listen to his mother?? Very fun choosing the perspective of a creature. What a delightful story! I really hope Buckwheat is just ignoring Mama :-). Wonderful! I'm loving everyone's interpretation of this prompt! If I hadn't know about it, I wouldn't have noticed the ingredients. I'm dying to know what happened to buckwheat? 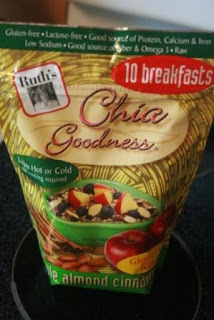 Never heard of Chia - will have to look for it. I really liked this. It was so sweet and it bounced around just as I'd imagine a squirrel would. Oh no... where is Buckwheat! please don't kill him please. I'm usually not a fan of anthropomorphism in fiction but you've done a wonderful job with this. I enjoyed the pace and the description of nature that you've managed to keep detailed without being tedious. Well, I just can't wait to hear what Buckwheat's gotten into. (I'm opting to take the positive route, trusting he's safe.) Fun, captivating story. No!! Not Buckwheat! Seriously, I gasped when I read that. Don't judge. Yes, it's a chipmunk, but I am still feeling for that pure, melancholy mourning momma. Very nicely done. I enjoyed this top to bottom.